A plane landed safely without its front landing gear at O'Hare International Airport Saturday afternoon. CHICAGO (WLS) -- A plane landed safely without its front landing gear at O'Hare Airport Saturday afternoon. 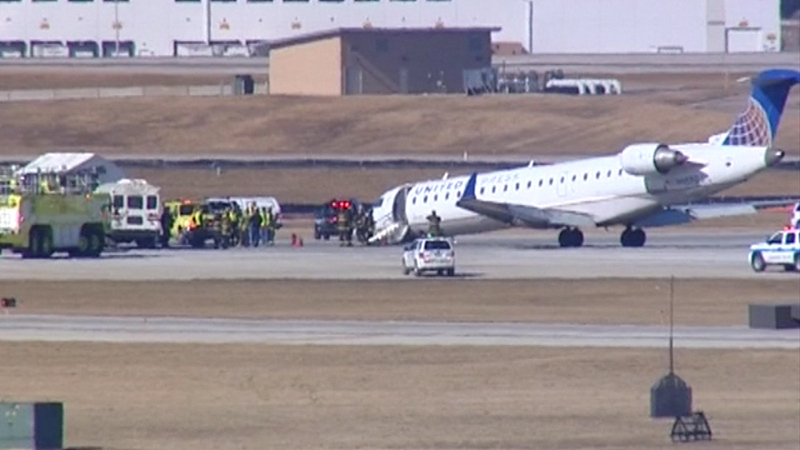 No one was hurt on Go Jet Flight 3645, which is operated by United Airlines. Passengers were able to de-plane through the main cabin door. Passenger Jim Petzing said the pilot made an announcement that the plane's front wheels wouldn't deploy and to brace for landing. "Babies were crying, the woman in front of me was sick to her stomach and then we landed on the two wheels in the middle of the plane," Petzing said. But then as we went down the runway, the plane tips forward then we dragged a little. I was worried that we'd, you know, flip over, but the pilot did an amazing job." The flight originated in Grand Rapids, Mich.